I like to play these games with Brad where I ask him a ton of questions in hopes he is going to surprise me with some hidden unknown exciting piece of information. He doesn't like to play and I can only assume he finds this game a modern form of torture. He hardly gives me anything new, regardless I still like to play. Last night I was asking him to tell me all of the cookies that he remembers on his mother's Christmas cookie plate. He named one. His mom is a fantastic cook and baker so, I am almost certain there was more then one. I proceeded to ask about his grandmothers and all I got was a blank stare. He was no help. I was prompting this line of questioning because I can remember every cookie on our cookie plate, which family member liked them and where the recipe originated from. I want to develop a memorable cookie plate. The cookie plate is one of the best parts of the holiday season for me. Years is what I figure it will take me to get to that plate that contains the family tried and trues but, I will get to that plate and when Carter's wife asks him this very question he will not respond with one type of cookie! My cookie plate is definitely a work in progress but, the oreo truffle balls are one holiday candy I come back to year over year. As of now they are a cookie plate staple. Mix cream cheese and oreo crumbs until well blended. Shape into 1 inch balls and place on parchment lined baking sheet. Place shaped balls in refrigerator or freezer for ~20-30 minutes to firm up. 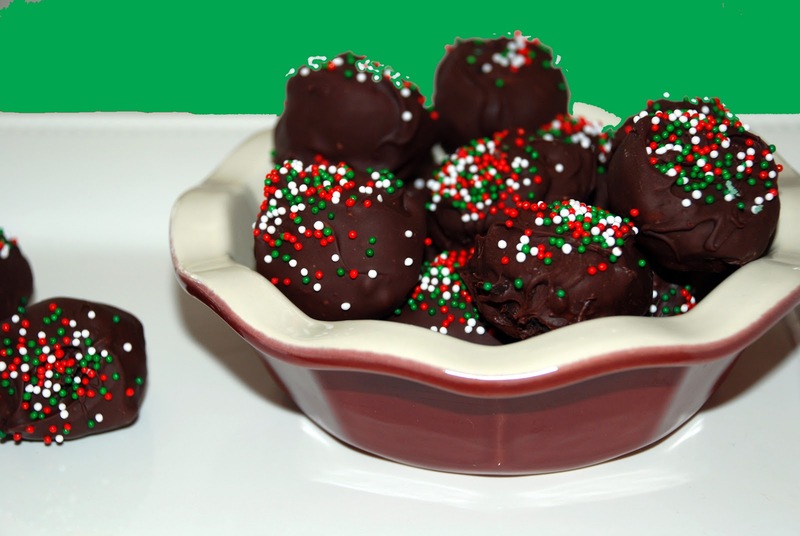 Melt chocolate of choice using either a double boiler or microwave. Once chocolate is melted take one ball at a time and dip into chocolate. Tap excess chocolate off and place on parchment to harden. Sprinkle with decoration if using while chocolate is still warm. Once cooled they can be stored in refrigerator in an air tight container.